This cozy, loungey patio makes the most of a small urban outdoor space. It is, indeed, a terrific place for relaxing outdoors, entertaining friends, and with its outdoor lounging bed, it’s a great place for a nap! The backyard deck belongs to Katie Gavigan of Katie Gavigan Interiors, who gave it a full makeover for our Patio Style Challenge. When the sun is shining, both my husband and I gravitate outdoors. We consider it an incredible blessing to have a fairly huge, south-facing deck (and yard!) off the back of our little house in San Francisco. Outdoor space is fairly rare in the where we live, and it’s fun to share! And although it’s definitely always felt like an extension of our main living space, it hasn’t really received the attention it deserved (until now)! Last spring we made some major improvements, including painting the exterior and the fence, and adding some decorative elements. These updates provided a great foundation, and helped us figure out how we really ended up using the space. Needless to say, we were thrilled when The Home Depot extended the invitation to take this space to the next level in its Patio Style Challenge. After a rainy winter, the deck was a sad space and needed some love! The sconces from last year had all but fallen off the fence, most of the furniture had been pulled inside to be used elsewhere, and it was just neglected all-around. Another big change since last year is that the previously empty lot next door is now a construction zone (within arms’ reach)! This has definitely been an adjustment in some ways, but one really nice bonus is the new fence separating the two lots and giving our yard the definition it had been lacking, and making our property feel a little more manageable to address. As I looked through my “outdoor spaces” Pinterest board, I realized I’m typically drawn to spaces that are calm and mainly neutral, with some calm blues and greens. This is fairly different than the way I tend to approach our interior, but I think it’s because the outdoors has so much inspiration on its own, with a lot going on visually, and my eye craves a place to rest. And even with the new fence, the space is far from contained and we have neighbors fairly close on every side – it’s a lot for the eye to take in! So, we set out to create a classic, timeless, relaxing and beautiful oasis. And as we thought about the practical use of the this space, comfortable seating was at the top of the list, so the Lynnfield 5-piece Patio Chat Set from The Home Depot is a very welcome addition! The set is super sturdy and really great quality, and the chairs are nice and deep for comfy lounging, which I love. One of our top priorities for the space was a rug, and Biscayne Area Rug from Home Decorators Collection with its subtle diamond pattern is the perfect piece to ground the seating area and add some great texture. What I love about this rug is that it’s just the right balance of indoor/outdoor for our space. While I love the durability and ease of the more plastic-feeling outdoor rugs, let’s face it— they’re not the happiest things your feet have ever met. This one feels wonderful on bare feet, while also having the durability and easy-to-clean factor going for it. Win! My decorating style is very much a mix of high/low, old/new. I love how the modern-classic lines of the new set juxtapose with our existing rattan sofa, which was freshly spray-painted for the season. 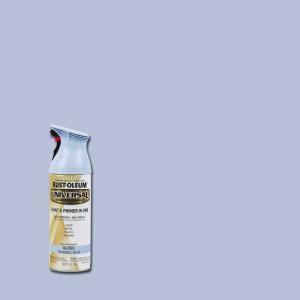 Although it was already a beautiful piece, Rust-Oleum’s gloss navy blue absolutely gives it new life and helps to break up the expanse of the brown deck. You may have noticed the light blue end table next to the sofa, which is actually the fifth piece of the seating set. Once again with my favorite DIY skill, I spray-painted this one with Rust-Oleum’s gloss tranquil blue for some soft, subtle variety in the color scheme. I LOVE this color, and you’ll notice that I used it as the common thread to unify the various accessories sprinkled around the space. These cool sconce screens, as sturdy as ever, were looking a little sad from being exposed to the elements, but this was nothing a little spray paint couldn’t fix. One easy/quick change we made, along the lines of lightening up the overall feel, was replacing the larger back chair cushions with small lumbar pillows. I used the filler from the floral pillows included with the set, and re-covered them with African-inspired geometric outdoor fabric. We can easily swap the original back pillows in/out depending how much cushion is desired. Another common theme that emerged from my inspiration images was the idea of lounge seating. Not just any lounge chairs, but extra-cozy, deep, wide, really lounge-y lounge seating. After all, one of the important functions of our deck is to facilitate naps, and what better way to fill the back corner nook of the deck? It was settled. I came up with a rough idea of how to implement, texted a few friends/family for input, and enlisted a friend to actually build the thing for me (as it was definitely beyond my skill-set!). The basic premise is a bed frame made with pressure-treated wood; the most outward frame is 2 x 6’s, with 2 x 4’s nestled just inside of this with the slats resting on them. We definitely ran into some glitches (mostly caused by my faulty measuring :/), but thankfully my friend is a wiz and found ingenious solutions to make it work! The legs are actually bedposts we salvaged from an old bed frame. I found the frame in pieces a few years ago at a nearby salvage yard and loved it. We’ve been using the headboard ever since in our bedroom, but hadn’t really put the other various pieces to good use until now. As I was researching and planning, I noticed really pretty and interesting legs on a lounge bed in one of my inspiration images, and the light bulb went off! We just cut them down to the desired size, and to attach them used table leg brackets (similar to this top plate). And finally, the mattress! My original plan was to make a cushion from high-density foam, like you would a bench cushion. Well, I wasn’t able to get my hands on what I needed just yet (long story), so what you see here is a very makeshift and temporary cushion situation I concocted with a collection of cushions/pillows/foam from around the house…but you get the idea, right?! The bottom line is… I highly, strongly, positively recommend an oversized outdoor lounge bed for everyone’s deck or patio! It turns a patio into a loungey patio. I’m in love, and looking forward to some good naps right there. Can I tell you how excited we are to try out this beautiful new grill from The Home Depot? 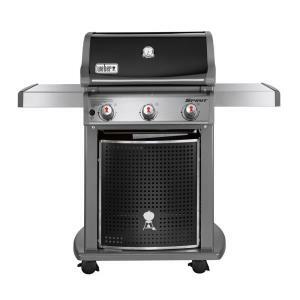 It’s the Spirit E-310 3-Burner Propane Grill from Weber. It seriously upgraded our outdoor cooking capabilities, and I’m so looking forward to breaking it in very soon. My sister sewed the grill cover for me last year, and we were excited to be able to reuse it, especially for this shiny new model! And, plants! One thing I’ve learned about incorporating plants in an outdoor area is that patience is key, and it’s worth it. Of course, I’d love to purchase fully-grown plants/trees for an instant tropical oasis, but that’s not my reality. We’ve found that succulents really thrive in our backyard, and have taken full advantage of this! A few years ago, we planted a handful of small succulents along our back retaining wall, and it’s just recently that they’re really filling in the space and becoming what I envisioned. And there’s something so amazing about the idea that this waiting and watching is all part of the process of making the house ours. One of my new goals is to grow some climbing vines in a few spots. You may have spotted the small bougainvillea plants along the fence… tiny burst of color at the moment, but so much promise to fill the fence with fun! And the white potato vines will add so much character to the back lounge nook, for starters. 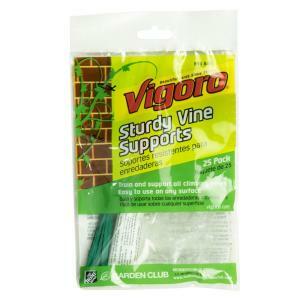 I found this handy vine support kit at The Home Depot, making my job that much easier! To fill the many pots and planters I’ve collected over the years (most of which have held plants which sadly are no longer with us), I simply snapped off branches from the back of the larger succulents and re-potted them. Instant succulent container garden! With this project, we also were able to extend our bistro lights to the back edge of the lot, which made a huge difference. The run along the fence line and the added definition adds so much cozy factor in the evening hours! It’s amazing how having this space finished makes the house feel so much bigger. Even when we’re not out there, it’s in view from our main living spaces and we’re enjoying it! We’re so grateful for The Home Depot’s help in making this happen, and are looking forward to lots of fun times out here in the months to come. Katie Gavigan is known for her collected, fresh, relaxed and classic style. You can see her portfolio and blog at Katie Gavigan Interiors. She lives with her husband in San Francisco. Browse our customizable patio collections, each with at least 16 fabric color choices and plenty of coordinating outdoor accessories. Follow our Patio Style Challenge board on Pinterest for more great outdoor decorating ideas from some of the most talented bloggers on the internet.